The Office of Health Policy (OHP) at The University of Texas MD Anderson Cancer Center administers and performs several cancer prevention and control programs funded through multiple sources, including the 1115 Medicaid Transformation Waiver, the Cancer Prevention and Research Institute of Texas (CPRIT) and the MD Anderson Moon Shots Program. Visit the links, below, to learn more about OHP programs in the following areas of cancer prevention and control. Us vs. HPV Webinar Series January 22 – 28, 2019. CME Credits Available. 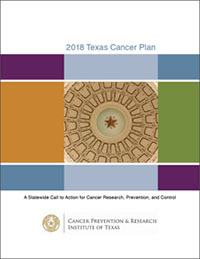 The Texas Cancer Plan (the Plan) aims to reduce the cancer burden across the state and improve the lives of Texans. As the statewide call to action for cancer research, prevention, and control, the Plan identifies the challenges and issues that affect our state and presents a set of goals, objectives, and strategies to help inform and guide communities in the fight against cancer. The intent of the Plan is to provide a coordinated, prioritized, and actionable framework that will help guide efforts to mitigate the cancer burden. 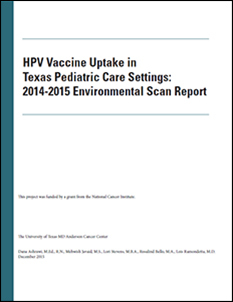 eliminate gender disparities in HPV vaccination and reduce geographic disparities in HPV vaccination rates. This campaign will also provide a critical strategy to save lives and lead the fight for a world without cancer. ACS is partnering with some of Houston’s most notable HPV vaccination champions to bring you the tools and resources that are needed to educate parents about the HPV vaccine and share best practices on how to increase HPV immunization rates. CEUs available for Someone You Love viewing. Event Time: 10 a.m.- 2 p.m., Registration begins at 9:30 a.m. The University of Texas MD Anderson Cancer Center Melanoma Moon Shot Program and Cancer Prevention and Control Platform seek to develop and implement community-based efforts related to the prevention and early detection of skin cancer, specifically melanoma, the deadliest form of skin cancer. These two teams collaborated to develop the Skin Cancer Prevention Toolkit For Institutions of Higher Education. 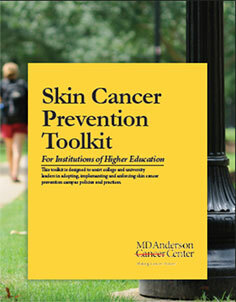 The toolkit is designed to assist college and university leaders in adopting, implementing and enforcing skin cancer prevention campus policies and practices. The tools and materials provided in this toolkit support and explain the benefits and rationale for a 100% Indoor Tanning-Free Campus Policy, a Sun Protection Campus Policy, and skin cancer prevention education and health services activities. This toolkit also provides resources and tips on drafting, enforcing, communicating and evaluating policy. To view/download the toolkit, click on one of the following links. 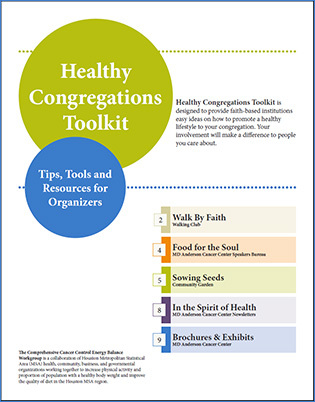 The Energy Balance Work Group at MD Anderson Cancer Center worked with local partners and healthcare professionals to develop the Healthy Congregations Toolkit. We are pleased to share this with you and hope that it is helpful in assisting you with incorporating healthy programs within your institution. The Toolkit focuses on "energy balance," or the way to eat well (energy intake) and being physically active (energy output) for better health. Walk By Faith: How to begin a walking club. Food for the Soul: MD Anderson Cancer Center offers speakers on a variety of topics for your congregation. Sowing Seeds: How to begin a community garden using list of local education resources. In the Spirit of Health: MD Anderson Cancer Center offers newsletters for your congregation via email. Brochures & Exhibits: MD Anderson Cancer Center offers these to support your congregation’s event or health fair. If you have any questions or concerns, please contact Marcita Galindez, MPA at 713-563-9517 or by e-mail to compcancercontrol@mdanderson.org. 2015 Summit on HPV-Related Diseases Presentations Now Online! HPV Fact Sheet (English) Updated September 2016! 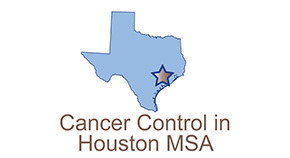 On behalf of the City of Houston/Harris County Community Transformation Initiative, the Comprehensive Cancer Control Tobacco Work Group at MD Anderson Cancer Center created a Houston/Harris County Tobacco Task Force (Task Force) to serve as a place for collaboration, resource development, and technical assistance to address tobacco use among college campus populations. The Houston Department of Health & Human Services received a planning award from the Centers for Disease Control and Prevention to build capacity to support healthy lifestyles in Harris County. The award targets tobacco-free living, active living and healthy eating, quality clinical and other preventive services, and social and emotional wellness. The work group was charged with lending their expertise to the development of a Tobacco Task Force Toolkit. 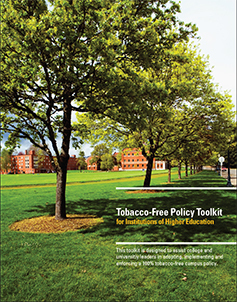 The purpose of the Toolkit is to provide a coordinated strategic framework for institutions of higher education in Houston/Harris County to develop and or strengthen their current campus tobacco policy. 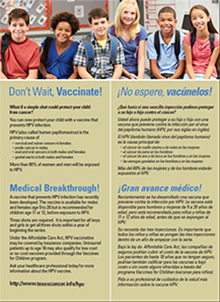 Vaccine Educational Poster: Don’t Wait, Vaccinate!/¡No espere, vacúnelos! The new Energy Balance Resource List has been made possible by the contributions of the members of the Comprehensive Cancer Control Energy Balance Workgroup. The purpose of this guide is to provide the public with a list of energy balance organizations in the Houston MSA working to improve the health of Houstonians by providing opportunities for educational programming, physical activity and nutrition. 2014 Texas Tobacco Summit a Success! The 2014 Texas Tobacco Summit, commemorating the 50th Anniversary of the first Surgeon General’s report, Smoking and Health: Report of the Advisory Committee to the Surgeon General, was held on June 26th-27th in Houston. Visit the Texas Tobacco Summit website at http://www.texascancer.info/texastobaccosummit to view the presentations and to learn more about the summit.